Established in 1956 as a salumeria in Brooklyn, NY, by a couple of Italian immigrants (last-named Sbarro), Sbarro is a quick-service restaurant offering New York style pizza, pasta, and salad at more than 800 locations in a staggering 33 countries. Most of its locations so far can be found in shopping malls and airports. Despite being one of the largest single-slice flingers, Sbarro has filed for Chapter 11 bankruptcy twice this century but now, like Michael Jordan, it’s making a second comeback. 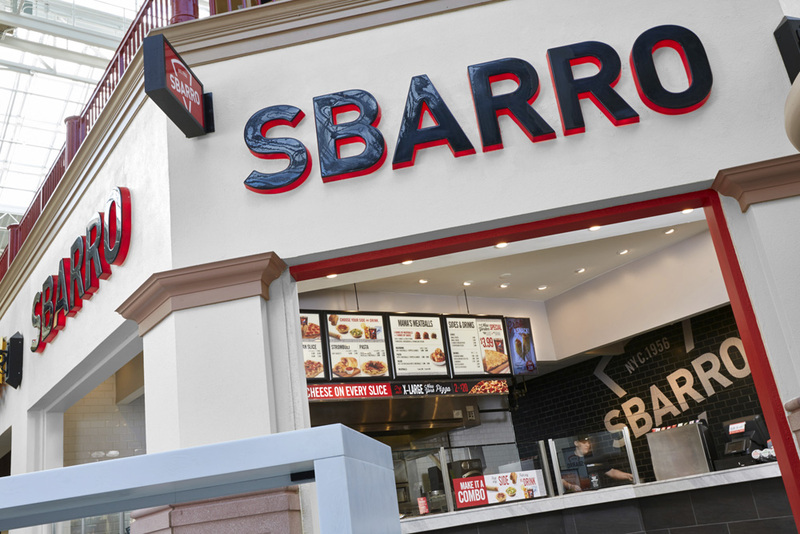 Since the start of the year Sbarro has been remodeling locations around the world and this September announced its first standalone restaurant in Columbus, OH, where they are headquartered along with the formal introduction of a new logo. No design credit given. Designed by Sterling Rice Group. The current state of Sbarro. As it’s said in other circumstances, the rug matches the drapery: Sbarro’s pizza is not good and the logo is not good, they are also not the most terrible things that you could eat or look at but at least they were in synergy in terms of setting expectations through a crummy identity and delivering through below-average pizza. Although not the pinnacle of design, the previous logo and surrounding identity worked remarkably well given the context in which it has to operate by relying heavily on the green-white-red Italian-flag color combination and italic typography to scream to passersby, “PIZZA! FAST!”. The new logo is a complete distancing from that aesthetic and helps signal a renewed purpose of better quality. The logo looks decent and now says “Pizza” more literally but also more politely. The all uppercase typography makes it look more upscale and the whole logo unit is fairly pleasant. Logo in different signage styles. From what there is available on Instagram, you can see that they are not settling on a single style of reproducing the logo in signage and that creates a nice system where anything is a go and allows Sbarro to look and feel slightly different from location to location. The tilting of the logo is a surprise touch that adds a bit of energy to the identity. A couple of updated mall locations. The more official retail dress is shown above and, compared to the image at the beginning of the post, the change is dramatic. It definitely feels like a completely new restaurant that will serve you a relatively tasty slice of pizza. Now, instead of trying to scream at the top of its lungs across shopping malls, the new facades calmly ask you to join them for a meal. 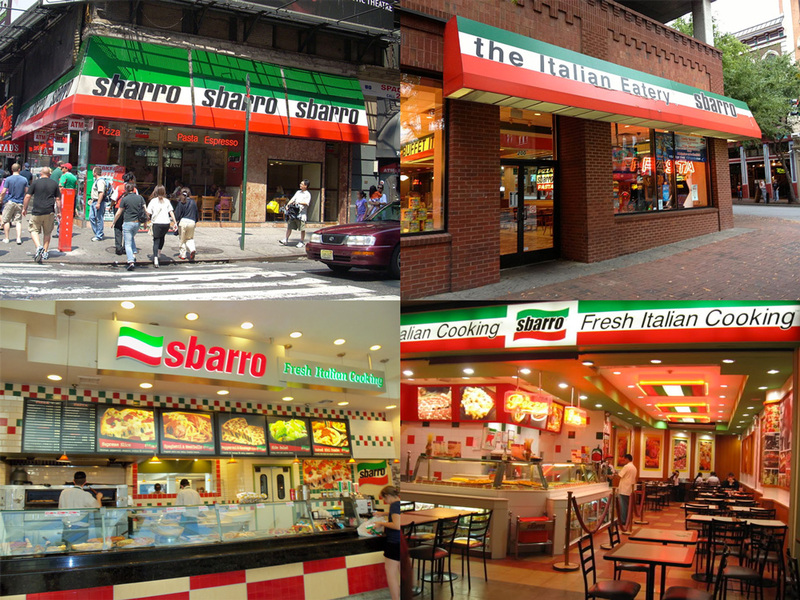 The change can potentially hurt Sbarro in the short term as anyone looking for the green-white-red bands in a food court will not find it at all and that sense of comfort will be gone, so it really is up to the food to deliver on the new message it’s trying to convey. New standalone restaurant in Columbus, OH. Overall, this is a risky change as it completely changes the face of Sbarro and it now also fits in the trend of mainstream food offerings going “artisanal” — Artisan Tostitos anyone? — and getting lost in it. Nonetheless, Sbarro deserves at least a quiet golf clap for taking the step to improve its brand. Thanks to John Olson for the tip. Established in 1956 as a salumeria in Brooklyn, NY, by a couple of Italian immigrants (last-named Sbarro), Sbarro is a quick-service restaurant offering New York style pizza, pasta, and salad at more than 800 locations in a staggering 33 countries. Most of its locations so far can be found in shopping malls and airports. Despite being one of the largest single-slice flingers, Sbarro has filed for Chapter 11 bankruptcy twice this century but now, like Michael Jordan, it's making a second comeback. 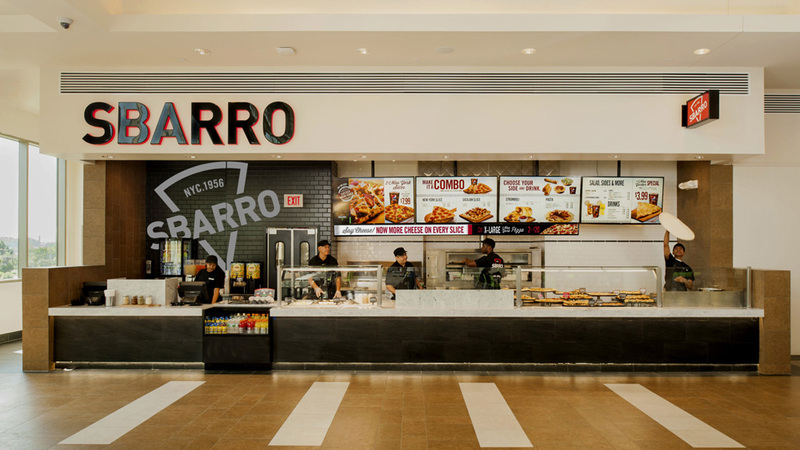 Since the start of the year Sbarro has been remodeling locations around the world and this September announced its first standalone restaurant in Columbus, OH, where they are headquartered along with the formal introduction of a new logo. No design credit given. Designed by Sterling Rice Group.